The International News Service and Film Production Blog reporting all quantum-level disappearances and supernova explosions in the Little Universe known as Alrugo. Do you ever lucid dream? Do you ever realise that you're dreaming whilst under the control of your subconscious? Some people achieve this point of enlightenment every single night, while for others, becoming lucid during REM sleep is a rare delight. However often this happens to you, one can not deny the incredible mixture of euphoria and excitement such a situation provides. With enough practice and training, one can basically take complete control of their own subconscious and make the dream world obey their command, creating an existential utopia to frolic and dance around for even the briefest of moments. 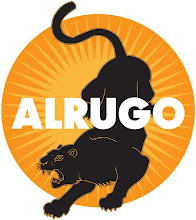 For the next 3 minutes, 7 seconds, we present to you, your own personal DREAMTOPIA, courtesy of Alrugo. I can now say with the utmost confidence that what you just witnessed, is at LEAST 200% better than any dream you've had in the last forever. Am I right? You bet your sweet bippy I am. They don't call me Michael Crisci: Dream Master for nothing! Or for anything. Or at all. Fun Fact 1: This whole episode and another future episode were shot on Hindmarsh Island, South Australia, at a place known only as The Shack. It was hot that day. Very hot. Especially for dudes in red skivvies and green wetsuits. 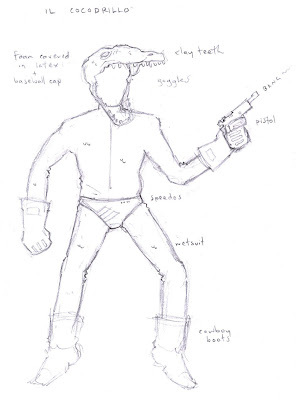 Step One: The original production design of Coccodrillo's Croco-Suit, created by Sir Tait Wilson. Step B: Dr Will Spartalis gets into the sweat factory of a wetsuit covered in non-breathing green coloured house-paint, with assistance. jesus christi I need a Gallo Super Quiet... NOW!!! Italian Spiderman is my favorite thing right now. Funny, classy, and so full of referential artistry that any fan of modern and past film, pop-culture and plain absurdity can't help but love it. Alrugo is king, and Italian Spiderman is the excalibur that will secure the kingdom. So to speak. If you will. As it were. I never thought that one's expectations would be lived up by that awsome trailer, but you truly outdid yourselves! I can't wait for the next one!